It's the end of the road for the protons this year after a magnificent performance from the Large Hadron Collider (LHC). On Friday, the final beams of the 2017 proton run circulated in the LHC. The run ended, as it does every year, with a round up of the luminosity performance, the indicator by which the effectiveness of a collider is measured and on which the operators keep a constant eye. 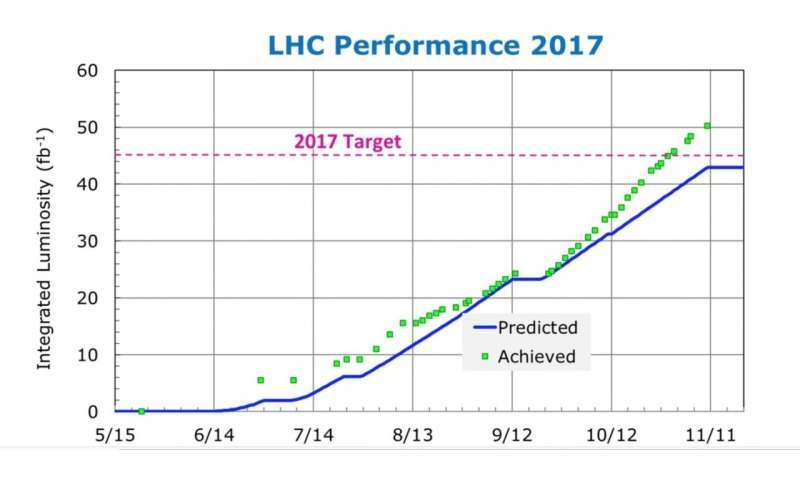 The LHC has far exceeded its target for 2017. It has provided its two major experiments, ATLAS and CMS, with 50 inverse femtobarns of data, i.e. 5 billion million million collisions. The inverse femtobarn (fb-1) is the unit used to measure integrated luminosity, or the cumulative number of potential collisions over a given period. This result is all the more remarkable because the machine experts had to overcome a serious setback. A vacuum problem in the beam pipe of a magnet cell limited the number of bunches that could circulate in the machine. Several teams were brought in to find a solution. Notably, the arrangement of the bunches in the beams was changed. After a few weeks, luminosity started to increase again. At the same time, over the course of the year, the operators have optimised the operating parameters. Using a new system put in place this year, they have notably reduced the size of the beams when they meet at the centre of the experiments. The more squeezed the beams, the more collisions occur each time they meet. Last year, the operators managed to obtain 40 collisions at each bunch crossing, with each bunch containing 100 billion particles. In 2017, up to 60 collisions were produced at each crossing. Thanks to these improvements, the instantaneous luminosity record was smashed, reaching 2.06 x 1034cm-2s-1, or twice the nominal value. Instantaneous luminosity corresponds to the potential number of collisions per second. 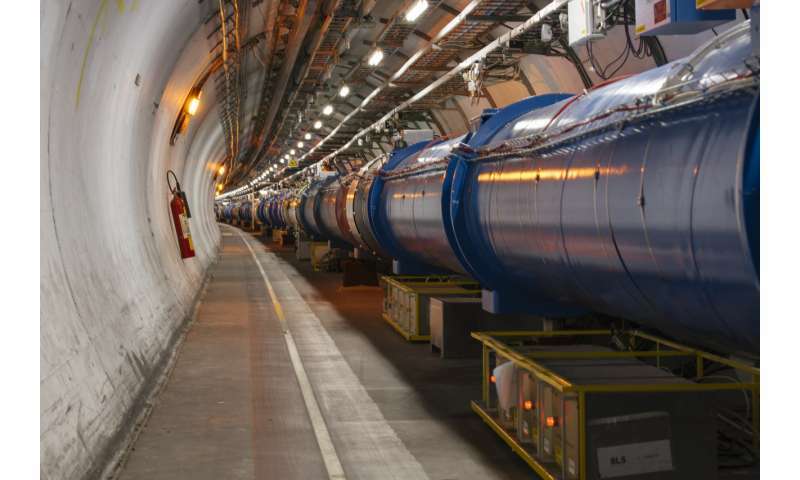 The LHC will continue to operate for another two weeks for two special runs including a week for operation studies. The first special run will consist of carrying out proton collisions at 5.02 TeV (as opposed to the usual 13 TeV), the same energy as that planned for next year's lead-ion runs. This will enable physicists to collect data with protons, which they will then be able to compare with the lead-ion data. The second special run, at very low luminosity, will provide data for the TOTEM and ATLAS/ALFA experiments. These two experiments use detectors located on either side of two large LHC detectors: CMS in the case of TOTEM and ATLAS in the case of ATLAS/ALFA. They study interactions called elastic scattering, where two protons merely change direction slightly when they interact, rather than colliding. For these studies, the LHC makes the beams as wide as possible. What's more, the energy will be limited to 450 GeV, i.e. the energy at which beams are injected from the accelerator complex into the LHC. Finally, the operators will carry out a "machine development" campaign. Over a week, they will perform operating tests to improve the accelerator's performance still further (it can never be too good) and begin to prepare the High-Luminosity LHC, which will take over from the LHC after 2025. When these tests are over, the operators will stop the machine for the year-end technical shutdown. And still no black holes or strangelets. I guess zephyr was wrong.